In this paper, we review the most recent and often conflicting findings on conventional measures of executive control in autism spectrum disorders. 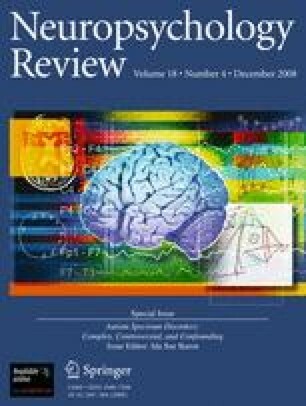 We discuss the obstacles to accurate measurement of executive control, such as: its prolonged developmental trajectory; lack of consensus on its definition and whether it is a unitary construct; the inherent complexity of executive control; and the difficulty measuring executive-control functions in laboratory or clinical settings. We review the potential of an ecological-validity framework to address some of these problems, and describe new tests claiming verisimilitude, or close resemblance to “real life” demands. We also review the concept of veridicality, which allows for the measurement of the ecological validity of any task, and discuss the few studies addressing ecological validity in individuals with autism. Our review suggests that a multi-source approach emphasizing veridicality may provide the most comprehensive assessment of executive control in autism. We thank Alex Martin for his review and helpful comments on this manuscript and Richard B. Roberson III and Kathryn F. Jankowski for assistance with its preparation. We also thank the people with autism and their families who have educated us over the years. The views expressed in this article are those of the authors and do not necessarily reflect the official position of the National Institute of Mental Health (NIMH), the National Institutes of Health, or any part of the U.S. Department of Health and Human Services. Mention of trade names, commercial products, or organizations does not imply endorsement by the U.S. government. LK is supported by an award from The Isadore and Bertha Gudelsky Family Foundation and the Intramural Research Program of the NIMH. LA is supported by awards from the Organization for Autism Research and The Isadore and Bertha Gudelsky Family Foundation. GLW is supported by the Intramural Research Program of the NIMH. BEY is supported by the Intellectual and Developmental Disabilities Research Center (NIH IDDRC P30HD40677).